A fascination with stevedoring in the late 1970s and early 1980s conveyed Curt Gauthé from his hometown of Port Allen, Louisiana, to transportation hubs across the globe. For the next 30 years, Gauthé built a resume of brown water work and blue water experience that fortified an interactive management style — drawing him deeper into the oil and gas supply chain, and world of international logistics. Recently, the 58-year-old business owner has been reflecting on the people, tools and relationships that helped spearhead the 2015 launch — and are contributing to the growth — of American Pipe Handlers, a logistics services company that specializes in transporting and handling tubular steel. Gauthé, founder and president of American Pipe Handlers and its non-asset management company, American International Maritime Co., has over the past five years occupied himself with developing resources and grooming associations to enlarge the footprint of a budding organization. In late 2014, Gauthé began laying the groundwork to do business with domestic pipeline contractors, midstream operators, U.S.-based steel mills and offshore manufacturers. Today, with 36 employees, the outfit is positioning itself as a pipe yard and logistics services company with an emphasis on delivering cargos being carried by truck, rail, ocean vessel or barge. American Pipe Handlers during the past four years has crisscrossed the United States, undertaking domestic and international projects from Ohio to Maryland, West Virginia to Pennsylvania, different regions of Alabama, Mississippi, Florida, Nebraska, and West Texas. The company, with an operational scope that includes designing and building out pipe yards and maintaining pipe inventories, also transports curved-surfaced materials for contractors primed to string and assemble them in the field. One focus area for American Pipe Handlers is unloading and staging pipe segments that land on American shores by way of ocean liners originating in Greece, Turkey, China, Korea, Japan and other parts of the world. From this maritime perspective, heavy-material movers have an opportunity to gain perspective on the complexity of unloading, loading and transporting large quantities of cylindrical stock as they labor to keep workers safe and prevent damage to pipe lengths while re-handling the freight at various intervals. 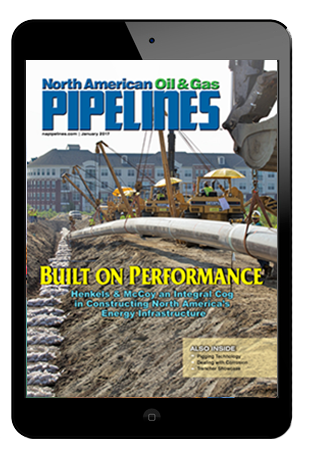 To that end, the proper selection of tools and specialized equipment is imperative in the world of pipeline transportation and logistics, including the physical distribution of the mill-coated steel pipe in which American Pipe Handlers is engaged. Over the past 12 months, American Pipe Handlers has been evaluating the durability of its material-lifting methods, diving deeper as the company worked to wrap up the last of three successive projects involving more than 800 miles of 24 in. OD and 26 in. OD pipe destined for construction of the Sunrise pipeline expansion and Cactus II pipeline system. At the same time, American Pipe Handlers has been gauging the quality of its long-term relationship with Tulsa-based Vacuworx, a forerunner in the proliferation of vacuum lifting technology. Vacuum lifting in recent years has gained greater predominance in the oil and gas industry as contractors, comparing the technology with more conventional techniques, have worked to modernize their approach to material handling solutions at port facilities, pipe mills, laydown yards and rights of way. The primary components of Vacuworx Lifting Systems, which are operated by electronic wireless remote control transmitters and matched receivers, are a vacuum pump that maintains a constant vacuum, a vacuum reservoir and valve that provides vacuum in the event of a power failure, and a vacuum pad. When activated, the system pulls a vacuum between the pad and object to be lifted, providing a positive seal and creating the necessary suction. Offered as an alternative to using hooks, slings or chains, the systems can help reduce the risk of accidents by mitigating potential hazards that should be taken into account while lifting, lowering and stabilizing pipe loads. 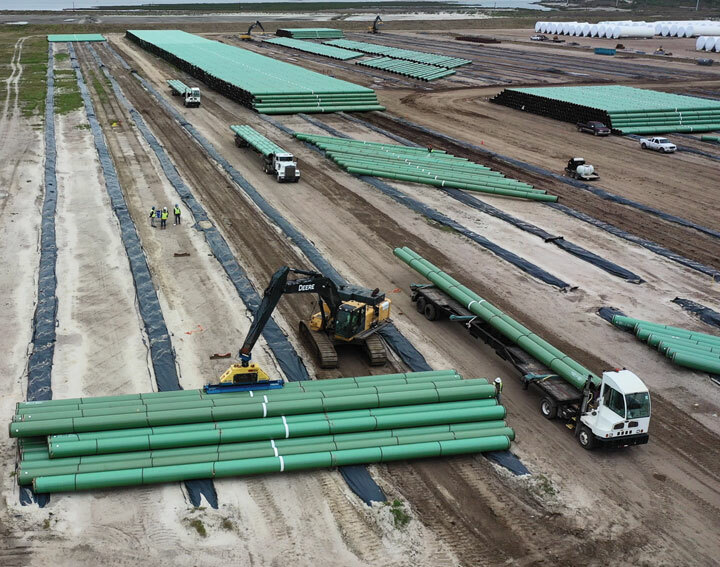 American Pipe Handlers in early 2018 started its haul of a Permian Basin pipeline project freight when the first of 17 shiploads began arriving at Port Aransas, Texas. 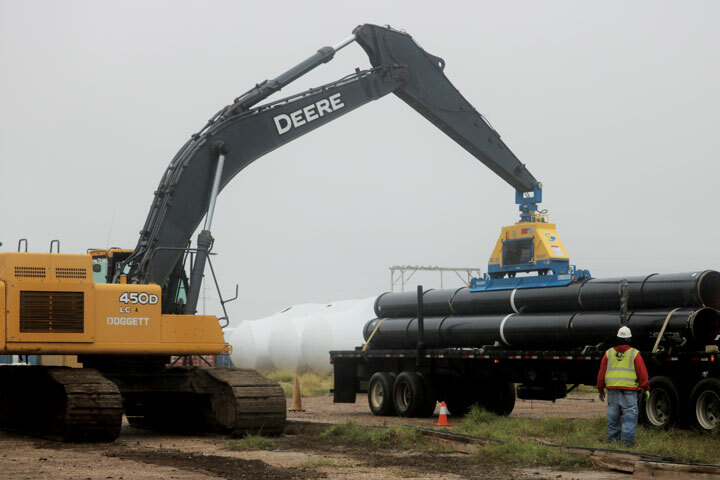 Tasked with transporting the FBE-coated pipe joints hundreds of miles to staging areas owned or operated by American Pipe Handlers across West Texas, the company also delivered stockpiles to their end destination points. With anywhere from 3,500 to 4,000 pipe joints per ocean vessel, Gauthé has been doing the math in terms of the number and frequency of lifts performed as each pipe segment was unloaded, inspected, racked and ultimately carried to the right of way. The cargos, first unloaded by ship gear hooks from the vessel and onto drayage trucks, were initially transported by American Pipe Handlers from the port terminal to a 25-acre port storage yard that the company constructed about a mile away. From there, each piece of pipe was picked up — and laid back down for inspection — using Vacuworx RC 20 Series lifters coupled with John Deere 350, 450 and 470 excavators. Gauthé, noting that each of the 17 ships required six to eight days to discharge, said that on any given day American Pipe Handlers’ cyclical workload added up to an estimated 1,000 joints as 30 to 36 truckloads of pipe rolled out of Port Aransas, on its way to be handled again at staging areas in Haskell, Grandfalls, Dilly, Del Rio or Big Spring. 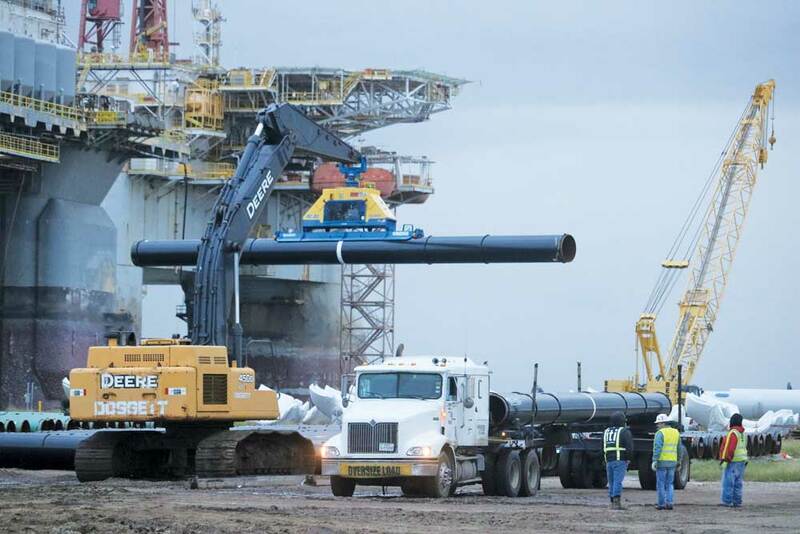 Altogether, over the course of its Sunrise and Cactus II pipe-handling projects, American Pipe Handlers lifted and maneuvered more than 62,000 segments of 24 in OD and 26 in OD pipe. The majority of pipe lengths, some 90 percent to 95 percent of the total, were 80 ft QRLs, with the balance made up 40 ft DRLs used primarily for crossings such as roads, highways or canals. American Pipe Handlers moves 76-ft long, 26-in. diameter pipe joints that weigh 8,500 lbs each from the ocean vessel to the yard for inspection, prior to moving them to right-of-way staging yards some 300 miles away. When taking into consideration the numerous variables and moving parts required to perform approximately 220,000 pipe lifts — while maintaining a project timeline, protecting the well being of laborers, staying on budget and preserving the integrity of cargos — Gauthé said dependability is one key to tying it all together. American Pipe Handlers, based in Port Allen, is fully integrated with American International Maritime Co., a third-party international and domestic marine logistics management company. Combined, the two companies, with offices in Houston and Mobile, Alabama, boast more than 150 years of experience in maritime handling and industry transportation services. Gauthé is sole owner of both entities. From 2015 through January 2019, Gauthé said, American Pipe Handlers had used the Vacuworx system to lift and maneuver 4,000 miles — more than 21 million linear feet — of pipe. He credited the equipment manufacturer’s involvement with day-to-day operations, and its timeliness in terms of responding to concerns or addressing needs as they arose. He boiled the future of his organization down to the maintenance of long-term relationships among employees, vendors and subcontractors who are committed to their ongoing success. “We’ve moved a lot of pipe with these vacuums since we started in 2015,” Gauthé said. “Those machines are holding up; you’d be hard pressed to find a duty cycle that’s comparable. Vacuworx has proved itself. The Sunrise pipeline expansion, extending the system from Colorado City, Texas, to Wichita Falls, was designed to enhance connectivity for crude oil produced and transported through the Permian Basin region to the nation’s largest oil-storage hub in Cushing, Oklahoma. The Cactus II pipeline system, including a combination of existing pipelines and new pipeline construction projects originating in Wink, Texas, and extending to Corpus Christi, will have a capacity of transporting 670,000 barrels of Permian Basin crude per day. That system, targeted for partial service in the fourth quarter of 2019, is expected to be fully operational in the second quarter of 2020. Todd Razor, president of Three Razors Media, is a multimedia storyteller residing in Des Moines, Iowa. He covers people, projects, trends, innovations and technologies in the construction, real estate and manufacturing industries.